A toast-worthy design that combines a handsome, faux-leather-bonded flask with a built-in shot glass. Perfect gift for my bridal party. Exactly what everyone didn't know they needed. Sure you can just pass the flask but this adds a little flair. It was a gift for my husband who is into "well designed" unique items. The flask is very fun to use and the shot glass comes out easily, but the flask is hard to clean. 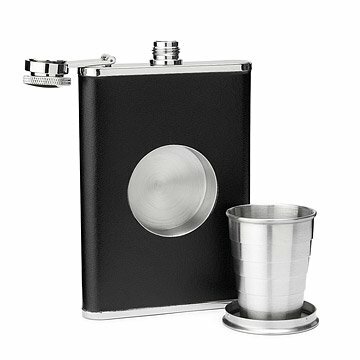 This flask is so cool because of the telescoping shot glass! It's very easy to use and makes a great gift. Collapsible shot glass is perfect for pregaming. Who wants to use someone else's used shot glasses? Best way to take shots on the go.